Only 1700 ft from the spectacular Petronas Towers, the luxurious Prince Apartment offers well-furnished designer apartments with free internet. It provides a spa, an outdoor pool and a fitness center for convenience. 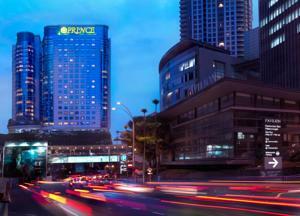 Prince Serviced Apartment is located along Jalan Onlay, a convenient 2-minute drive from Pavilion Shopping Mall. It is a 40-minute drive from Kuala Lumpur International Airport and provides shuttle services to popular areas. The elegant apartments at Prince Kuala Lumpur come with a fully-equipped kitchen and spacious living room. Each comes with a DVD player and flat-screen satellite TV. Tea/coffee making facilities and a personal safe are also provided. Guests may arrange day trips with the concierge service or catch up with news at Prince Apartment’s business center. The hotel also provides a beauty salon and souvenir shop. Enjoy great views of the city’s skyline at The Terrace which serves refreshing drinks and light snacks, while Eccucino Restaurant boasts wood-fired pizza. Relax at Fidel’s Cigar Room after a hearty meal. It has an extensive wine menu and pool tables. Rooms: Apartments: 157, Hotel Chain: Worldhotels. Free! All children under 6 years stay free of charge when using existing beds. Free! One child under 2 years stays free of charge in a baby beds. One older child or adult is charged MYR 156.60 per person per night in an extra bed. The maximum number of extra beds/baby beds in a room is 1. Any type of extra bed or crib is upon request and needs to be confirmed by management. Supplements are not calculated automatically in the total costs and will have to be paid for separately when checking out.